Penn’s Football Team turned the Backyard Brawl into a Backyard Knockout. Coach Cory Yeoman’s Kingsmen slugged Mishawaka with 48 unanswered points and roared to the Northern Indiana Conference North Division Championship with a 48-7 victory against the Cavemen. Penn’s NIC title is the 36th in Program history. The Kingsmen have won seven NIC championships in a row. Penn only needed one play to erase a 7-0 Mishawaka lead. Zach Usenick hauled in a strike from Ryan Lynch and zoomed past the Cavemen defense for a 60-yard touchdown. 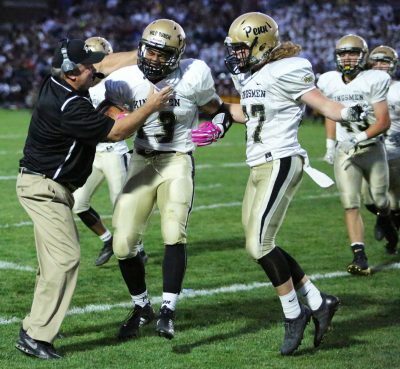 Paul Moala recovered a fumble on the Mishawaka 25 on the ensuing series and the Kingsmen cashed in with an eight-yard TD run by Ryan Whiteman. Penn’s two quick strikes triggered a Kingsmen scoring avalanche as Penn rolled up a 34-7 halftime lead. Whiteman ended up scoring three TD’s, the three-yard run, a 64-yard run and a 1-yard run. Quarterback Ryan Lynch scored on a 12-yard sweep. Lynch also had a second TD pass, a seven-yard connection to Brock Boynton. Trenton Horvath finished off the Kingsmen scoring with a four-yard run.